There was very little to choose from for this Tuesday. Originally the plan was to go to St Ives Town v Rugby Town, but that was called off due to Rugby needing a cup replay against Staffordshire side Norton United. The North West Counties side grabbed a great 1-1 draw at Rugby's Butlin Road on Saturday and had earned themselves a replay. I had visited the ground when I went to Port Vale and Rugby will have to play well to win there. I was basically left with 3 choices. Redbridge v Enfield Town in the Isthmian League Cup (I didn't fancy driving round London in rush hour) Staveley Miners Welfare v Dunkirk in the FA Cup (which was a bit far when I had to be up at 4am) So I plumped for Bishops Cleeve v Ashford Town (Middlesex) also in the FA Cup. I had been and taken a look at Bishops Cleeve's ground before, whilst on a midweek trip to Hereford. It was a smart and tidy ground, but was a bit out in the sticks so I was planning to find somewhere to eat before the game. In recent times they had changed their club colours from blue to green, and been sponsored by the Forest Green chairman's company Ecotricity. It looks like it may be a publicity stunt by the man who is a bit of a tree hugger. There are lots of 'green' features at Forest Green's stadium and they only serve vegetarian food in their tea bar. I'm all for people making their own choices and not having peoples views and ideologies forced upon them. If the argument is good enough, you will win it by persuasion alone. The visitors meanwhile were a team I had seen on several occasions. They had the Middlesex suffix after their name to avoid being confused with the Kent team of the same name. Ironically I had seen them almost a year ago to the day as they met Tring Athletic at this stage of the competition last season. They looked fairly comfortable as they eased through 2-0 against their lower division opponents. I had also seen them draw 2-2 in a revisit to Uxbridge's ground near the end of last season, in which was one of the better games I saw that season. I spent the morning of the game sending a parcel and doing a few other bits that I needed to do. I then had a few hours at home chilling before setting off at 4.15. It took the usual half hour to get to Aylesbury, picking up Anwar at 4.45 and making good progress until we got to Witney where there was about 15 minutes of traffic. However, worse, or at least more annoying was to come. After being stuck behind lorries on a single carriageway for ages, it finally opened up into a dual carriageway. I got past a few lorries, but an idiot in a Mercedes stayed level with the last lorry for the last mile of the dual carriageway, going at 60MPH in the fast lane. More suffering was to come, the lorry was going the same way as us and proceeded to do 20MPH in a 60MPH limit for around 5 miles. I was cursing the name of 'Downton' on the back of the wagon for their slow and selfish driving. Luckily we got to overtake safely eventually, and I made sure I gave the muppet a good toot on the way past. It meant I was late getting to the off license in Cheltenham that I wanted to go to. And an excellent one it was too, called Favourite Beers it had 120 different bottled ciders to choose from. I filled a basket, selecting 8 and will be saving those for the next couple of weekends. Good timing too, considering the England game is coming up on Friday. After that, we went to have a look at Cheltenham Saracens ground, who play in the Hellenic League Premier Division. For that level, the ground was very impressive, with 3 areas of covering, and all very neat and tidy too. 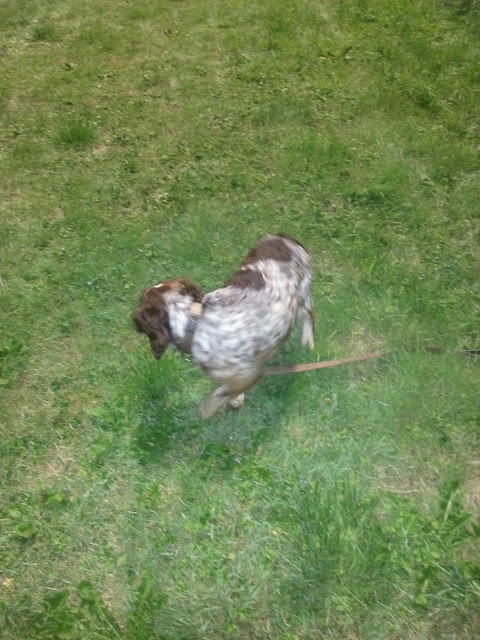 Though it was all locked up, I still managed to get a few decent pictures. 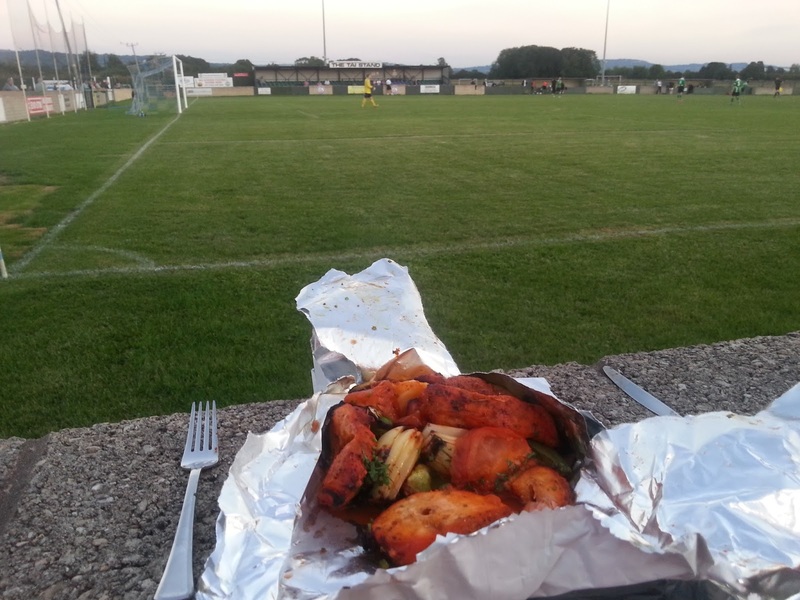 After that we navigated to Bishops Cleeve FC, and as it was still 35 minutes before kick off and the town centre was a mile away, we decided to go and get some dinner. I found a decent looking place that did curries, pizzas, kebabs and the like and settled on a Chicken Shashlik for £7.50. A tiny bit more than I expected, but I wanted something a bit healthier than I usually have. It took ages for it to arrive, nearly half an hour and I was starving by the time it came. But there was no time to eat it then, with 5 minutes before kick off, I lobbed it into my car and drove back to the ground, chucking my car in the nearest parking space and getting into the ground just as the teams were coming out. The game itself was pretty open, both sides hitting the woodwork during a first half in which started with Ashford in the ascendancy but ended with Bishops Cleeve being the team on top. I was hoping Bishops Cleeve would progress, after the good deed they did with the programme. But it was Ashford who prevailed. A header on 64 minutes by Samad Kazi won it for the visitors and after defending well and restricting the home sides chances to a few pot shots, they saw the game out comfortably. Whilst this was going on, there was a Wycombe game in progress. Kicking off at 7.15 meant that we scored our first goal through Matt McClure whilst we were on our way from the takeaway to the ground. We also grabbed a second later on, Anthony Stewart scoring to make the final score 2-0 to Wycombe away to the high flying Grecians. An excellent result, and one that sees us in the draw for the second round, which will be drawn on Saturday morning, live on Soccer AM. After a fairly easy drive home, I was back at mine by 11.30 after dropping Anwar off. For some reason I couldn't get to sleep for ages and after watching TV, I must have only got a few hours sleep. 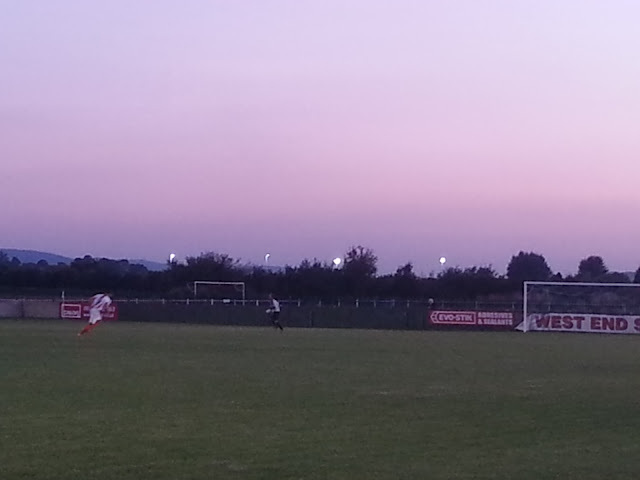 Elsewhere in the FA Cup tonight, as was keeping an eye on Atherton Colleries. I have a soft spot for them after hearing chapter and verse on them from my mate Joe on Facebook and Twitter. They were one of the few step 6 clubs left in the cup, playing at North West Counties League Division 1. They had faced Radcliffe Borough, 2 divisions on Saturday at their home ground, and had been unlucky to only get a draw. The replay was at Radcliffe on the night that I was watching this game. Despite taking a lead, they eventually lost 2-1, the first of the home sides goals coming from a controversial handball. I am going to follow all the FA Cup games that I have been to, see what happened to the teams before I saw them, and also where the chains lead. I will post each of them on every FA Cup blog that I do, and hopefully I will be able to rejoin further along the chain, or one of them will end up meeting Wycombe in the first round. 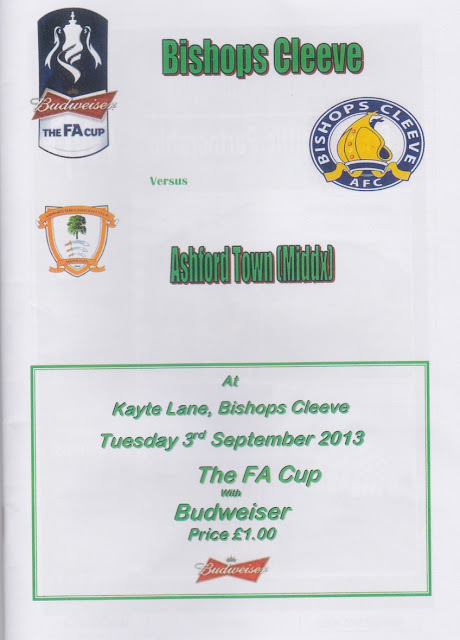 03/09/13 Bishops Cleeve 0 Ashford Town (Middx) 1 PRE R Ashford deserved it – just! The tea bar is very good, one of the best at this level, with a wide range of food at good prices. There was no club shop that I could see, but they did sell badges in the tea bar.. The clubhouse looked decent enough, but I didn't see what they served. If you have time, the town is around a mile away, and has an Indian, a pizza place, a chinese, a chippy and various other shops including a big Tesco. There is probably a pub there too, but I didn't see it.